Decided to do something a little more mainstream for all those Death Note fan girls out there. Inspired by this YouTube video. Remember to drink responsibly and be safe! As you may have noticed, I’ve moved Shojo Mojito to Saturdays. It was just too hard to get it done after work XD! 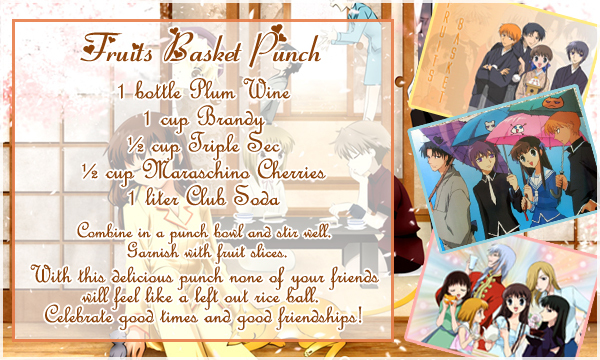 Anyways this week is a Fruits Basket Punch! It’s a delicious fruity drink that’ll make all of your friends feel included and special at your party. No more left out rice balls! This one is dedicated to all those Sailor Moon fans! I know back in the day I was shamefully in love with this series, and of course the leading bishi Mamoru (Darien). 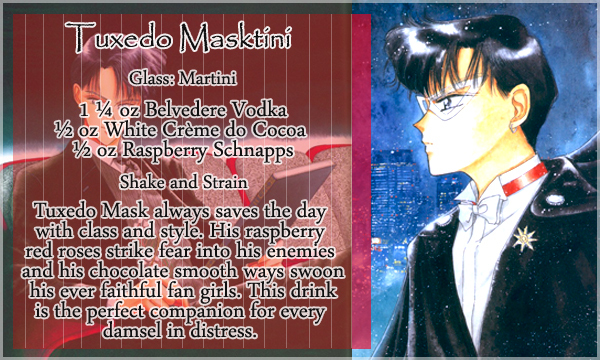 So all you fans, now you too can enjoy your very own Tuxedo Mask(tini). Remember to drink responsibly and stay safe! Waaaaah! Sorry this week’s a day late, I was out of town and completely spaced. 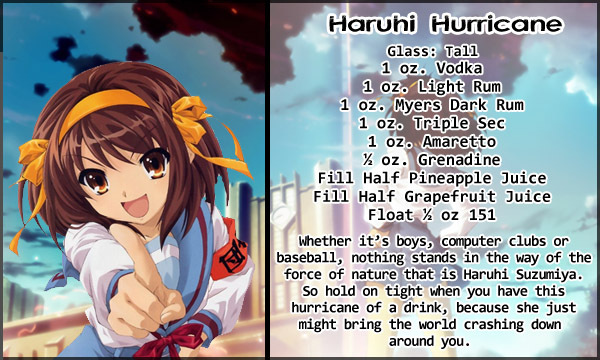 Anyways enjoy the Haruhi Hurricane inspired by of course, The Melancholy of Haruhi Suzumiya. Remember to drink responsibly and be careful in your drunken shenanigans! Edit: I totally forgot to add that I did a Hurricane drink because of Gustav. Good luck to everyone who’s having to brave the storm and stay safe! Welcome to the first installment of Shojo Mojito! 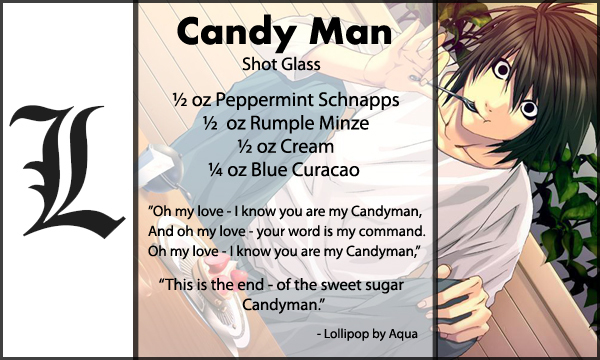 Every Friday (unless a horrendous hang-over strikes) I’ll be bringing you delcious drink recipes starring bishi boys and georgous girls from old and new shojo series! 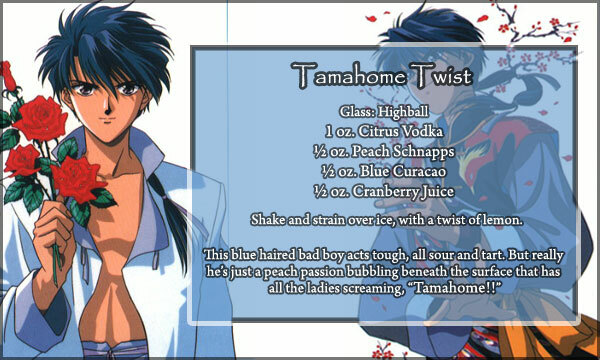 This weeks recipe is the “Tamahome Twist” inspired by, of course, Tamahome from Fushigi Yuugi (also known as “The Mysterious Play”. Enjoy and drink responbily!